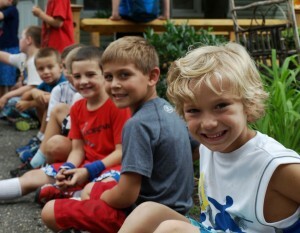 Our “skills oriented” program always takes into account the child’s age, strength and exposure to each activity. Batting tees in baseball, lowered basketball backboards, shortened ball fields and specifically designed equipment ensure success! Additionally, age appropriate field trips to local parks and museums enhance a child’s sensibilities of the natural world in which they live. In no way do we support or teach the negative aspects of competition. We encourage each child to do his or her “personal best” in a supportive environment. Team work, fair play and cooperation are the cornerstones of Maplewood’s physical education program. 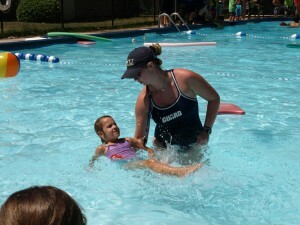 The Maplewood Swim program is an important element of our summer curriculum. Teaching and improving swimming skills is a primary concern for our parents and gets our top priority! There are obvious carry over values in regard to swimming due to its lifelong appeal and personal safety. Our Senior and Aqua Tot pools are specifically geared toward the age appropriate skills of both young and older children. Once a child is comfortable in the water, we have a complete Maplewood Aquatics Program which is the perfect primer to the American Red Cross Program. This insures that each child will be placed in a group that meets his or her specific abilities to start, and then advance up through the program at their own pace. Each child will swim daily. Half the time is devoted to instructional swim, with the remainder being “free swim” just for the fun of it! At Maplewood, we have a Giant Water Slide that always makes a splash! We also have a number of pool toys such as hundreds of rubber ducks, beach balls, dive rings that make swimming at Maplewood more than getting wet. At the pools, it’s always safety first! All of our lifeguards are fully certified by the American Red Cross as well as Nassau County. Our program is led by our own American Red Cross Certified Aquatics Director who manages our Water Safety Instructors and aquatics staff. 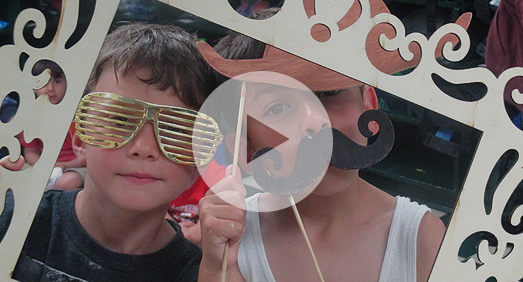 Registration for Maplewood’s 2019 Summer Program is now underway. Enrollment is limited. Please call the office for registration information. This year we are celebrating our 70th summer! Enroll now as groups close quickly. Click here for 2019 Tuition Rates. *Price includes: Field Trips & Off-site Programs. Lunch, snack, transportation and towel service are included in the tuition price. A $500.00 deposit is required per child. This deposit is fully refundable up until April 1, 2019. For any cancellation made after April 1, 2019, a $200.00 service charge will be applied. A 5% tuition discount will apply for each additional sibling. All summer program balances are due in full on April 15, 2019. Maplewood will be closed on Thursday, July 4th. There will be NO refunds or make up days. No refunds for any reason will be made after the first week. No make-up days for days absent. Please call us if you have any questions or are interested in a camp tour.